Vermouth is a fortified wine that is aromatized with a variety of herbs and spices. It comes in a few varieties, though dry (white) vermouth and sweet (red) vermouth are the most common. If you enjoy a martini or two, want to explore fancy or classic cocktails, or love sipping an aperitif before dinner, then vermouth will be an essential addition to your bar. Vermouth is a very interesting and useful cocktail ingredient, but it's also one that many people tend to brush off and ignore. Is your bottle of Noilly Prat covered in dust? Have you been storing that Martini & Rossi in the refrigerator? You may not realize it, but vermouth can go bad and you may not be getting its full flavor. The word vermouth is derived from the German word for wormwood, "wermut." Wormwood has long been the chief flavoring ingredient for vermouth, though it's better known as the provocateur that contributed to absinthe's once notorious reputation. It can still be found in some vermouth recipes, particularly dry vermouth, and all are perfectly safe. In 1786, Antonio Benedetto Carpano of Turin, Italy made the first sweet vermouth. Dry vermouth came along in 1800 and was created by Joseph Noilly of France. Both of these names can still be found on two of the most popular brands of vermouth produced today. As is often the case with herbal alcohol, vermouth was originally used as a medicinal tonic though its intoxicating qualities quickly turned it into a favorite aperitif. Vermouth is made by aromatizing wine with botanicals, then fortifying it with a small amount of distilled spirit. The liquor is often brandy though others are used as well. Making vermouth is a complicated and closely guarded process. There are many producers of vermouth, each using their own (often secret) recipe of herbs and botanicals. Some of the ingredients that can be found in vermouth are chamomile, coriander, gentian, juniper, saffron, and wormwood. Most vermouth is 15 to 18 percent alcohol by volume, which is equivalent to 30–36 proof. Since it's technically a wine, "proof" is typically not used, though. The use of vermouth as a mixer has defined many of the cocktails that we consider classics. Most notable among these are dry vermouth in a gin martini and sweet vermouth in a whiskey Manhattan. Those drinks that use an equal amount of sweet and dry vermouth are referred to as perfect drinks (e.g., perfect Manhattan and perfect Martini). Ordering a "dry martini" is asking the bartender to back off on the vermouth. Oddly enough, the less dry vermouth used in martinis, the "drier" it is: the "bone dry martini" uses a splash at most. A quality vermouth can also be enjoyed on its own or with a hint of citrus. Express the oils of a lemon peel into a glass and enjoy it with dinner. Vermouth also makes an appearance in simple cocktails in which the fortified wine takes center stage. The Adonis, bamboo cocktail, and vermouth cassis are among these recipes. Countless other cocktails play off the martini or Manhattan. In these recipes, vermouth can be paired with vodka for a vodka martini, brandy for a Fabiola cocktail, rum for a Jean Harlow cocktail, or even tequila for a tequini. As an aperitif, vermouth can be paired with other aperitif liqueurs and wines to create the ultimate drinks to enjoy with food. These recipes can get very interesting and may take some time to train your palate to accept the new taste, but they can certainly enhance any meal. For instance, the speranza pairs dry vermouth with Campari and vodka while the liberal cocktail opts for rye whiskey and Amer Torani. Once you add vermouth to your bar (and know how to properly store it to retain its flavor), you'll find numerous ways to enjoy it. Dry vermouth is also known as white vermouth or French vermouth. It is almost exclusively white in color (though it can have a yellow tint) and, as noted, originated in France. Dry vermouth is an obvious name that signifies this fortified wine's flavor profile. It is a dry version of vermouth that often contains just 5 percent sugar. This style is more notable for its blend of botanicals that pair so well with gin in the martinis that require it. As with all vermouth, dry vermouth can vary greatly in its taste. A good case in point is the famous brand, Noilly Prat, which is considered one of the best. 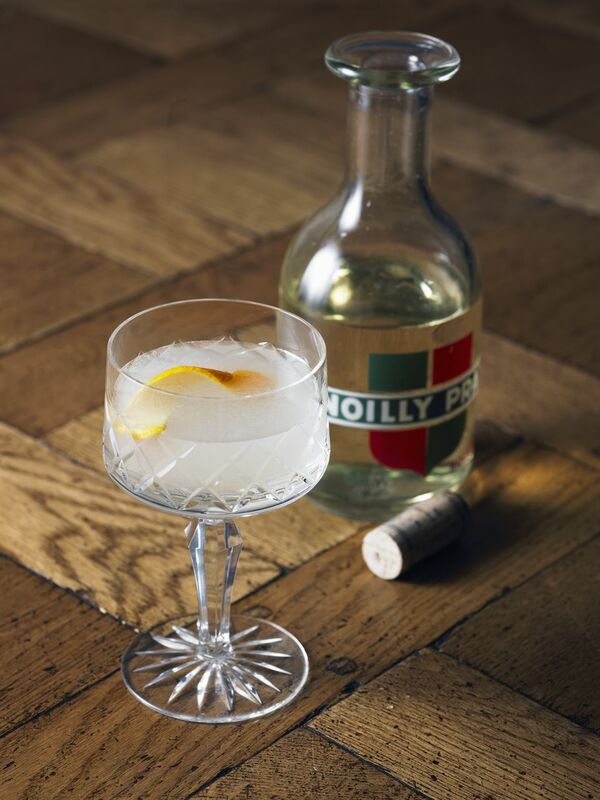 For a number of years, the Noilly Prat Dry Vermouth sold in the U.S. was not as robust as that sold in everywhere else. Americans just didn't have the desire for such a profile (as we saw when gin martinis were poured with virtually no vermouth). This has changed, though. Today, drinkers in the U.S. can choose between "Original Dry" and "Extra-Dry." If you want a softer vermouth, Extra-Dry is the U.S. formula that was sold here exclusively from 1979 through 2012. For a taste of really flavorful, European-style vermouth, opt for Original Dry. The difference in taste is noticeable and if you get a chance to try them side-by-side, do. Sweet vermouth is also known as red vermouth or Italian vermouth because it is red in color and originated in Italy. Sweet vermouth is sweet, but not sweet as in syrupy or sweet liqueurs like amaretto. It has a significantly sweeter profile than other vermouth and can include up to 15 percent sugar. Sweet vermouth can also have a notable vanilla aroma mixed with bright floral notes. Although it is most common to see a red-colored sweet vermouth, a white (or clear) sweet vermouth is also produced and can be labeled as bianco or blanc. Just like wine, an open bottle of vermouth can go bad after a period of time and the taste will take a significant turn for the worse. Since it's a hybrid of wine and distilled spirit, its shelf life falls in the middle. All vermouth should be refrigerated after opening. Vermouth is best when used within three months after opening. Any longer or warmer and it should be tested for quality. If it tastes bad, it is bad. The quality of your cocktails depends on fresh vermouth and it is easy to keep track of how long a bottle has been open. Make a habit of placing a small piece of masking tape on the bottle and write the open date on it. You will never again wonder how long it has been since you opened the vermouth. If you find yourself regularly wasting vermouth, downsize the bottles you buy. You can find 375ml bottles of many brands, though they're not quite as common as the standard 750ml. When your vermouth does go bad, save it for cooking. Fortified wines are great cooking wines and the "off" flavors will not affect your food as drastically as it will your cocktails. As with all alcoholic ingredients, vermouth comes in a great range of prices and that often reflects the quality. The good news is that vermouth tends to be less expensive than liquor, but some of the bottom-shelf brands can leave a bit to be desired. Fortified wines are a complicated category and there are many options available that mimic vermouth. These can be used as substitutes for vermouth and vice versa, though each has unique characteristics. Choose wisely because cocktail recipes come with specific recommendations for a reason. However, you might just find a new favorite here. Cocchi - Americano is similar to Lillet Blanc and can be used as a dry vermouth (use it in a twentieth century cocktail). Vermouth di Torino is a sweet vermouth. Dubonnet - Blanc is a fortified white wine that uses quinine. Rouge is more popular, sweeter, and richer with a red wine base (use it in a Napoleon cocktail). Lillet - Blanc has a slightly bitter and sweet orange profile (use it in a Vesper martini). Rouge is less sweet and bitter with notes of berries and spice. Technically, these are aromatized wines that are similar to vermouth. Uncouth Vermouth - This New York state producer creates a great range of flavored aperitifs including the wild raspberry used in the rustic Manhattan.